The doctor who says she has produced two cloned babies in the past weeks has told the BBC three more cloned children will be born by February. Dr Brigitte Boisselier, who is chief executive of the US-based Clonaid organisation, told the Breakfast with Frost programme that she had implanted five cloned embryos, two of which she says have already been born. The claims have been met with widespread scepticism by scientists around the world, and have provoked calls for a worldwide ban on cloning to be introduced. Clonaid is linked to the Raelian sect, which believes humans were created by extra-terrestrials. Dr Boisselier's firm said the latest cloned human being was born to a Dutch lesbian couple on Friday night at a secret location. DNA tests have still not been carried out on a baby apparently born on 26 December in Florida, which Clonaid says was the first ever human cloning. Dr Boisselier said that although the child's parents had promised to allow an independent expert to verify the cloning claims, they were concerned that the tests would reveal their identity or cause the child to be removed from their care. "I want these tests to happen as soon as possible... but not at any price," Dr Boisselier told the BBC. The couple are due to make a decision on the tests on Monday. However, she said she did not believe even a DNA test showing that the baby was indeed cloned would dispel the scepticism about Clonaid's claims. "I believe that even if we produce [a] DNA test they will doubt that... Probably in five years from now, people will say... it's OK". Dr Boisselier said several hundred embryos had been created for genetic testing before her team had conducted 10 implantations - five of which were successful. "Two babies are born now, we're expecting three before February," she said. 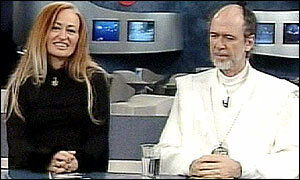 The founder of the Raelian sect, Claude Vorilhon, said cloning was just the first step towards achieving eternal life. He said Dr Boisselier's team was now working on an accelerated growth process to allow people to clone adult versions of themselves. The scientific community is sceptical of the group's claims. Dr Harry Griffin, head of Britain's Roslin Institute which cloned the first adult mammal, Dolly the sheep, told Reuters news agency: "There is no reason to believe this is anything other than a long drawn-out publicity stunt." Even controversial Italian embryologist Severino Antinori dismissed the Raelians' claims. "It's all false," Dr Antinori told the French news agency AFP. "It's depressing for people doing serious research on therapeutic cloning." Dr Antinori - a fertility expert who supports cloning technologies - said the Raelians were unwilling for their claims to be tested, showing their announcement was only for publicity. "Cloning is still a difficult process"
Can it really be done?